An Aria for Nick left me with tears of joy! It is an absolutely thrilling story that will draw the reader into a fast-paced and exciting world of espionage, romance, broken hearts, nightmares and redemption. I loved the second book in the Song of Suspense series! Aria Suarez is the youngest and only daughter of an Army Sergeant. She is beautiful, smart and a child protégé pianist. Aria has it all with a wonderful and supporting family and the best friend a girl could ask for. The only thing she’s missing is the boy she is hopelessly in love with, Nick Williams. But Nick won’t give her the time of day and seems oblivious to her advances. What will it take to win his heart? Nick Williams knows pain and he knows heartache. He has survived an abusive father and a miserable home life and all he wants to do is survive high school and get his diploma. His dreams are centered around entering the military upon graduation. As much as Aria intrigues him, she’s too good for him and he knows it. When Aria’s dreams are destroyed by a horrible act of violence and the heartbreak of a lifetime, she refocuses to a career in nuclear science. Without trying, she is swept into a sinister plot that threatens not only her safety but the wellbeing of the entire United States. 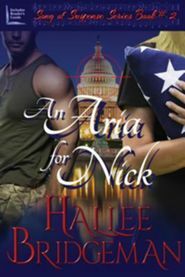 Aria must decide if she has the courage to fight for her own life as well as for the country she loves. Nick has spent his life being one of the best in the military. When he is recruited to solve a minor problem he has no idea that it will take him full circle in a life he thought he’d left behind. An Aria for Nick is a top ten book from start to finish. I could not put it down and was not disappointed at all. Definitely a must read! Ms. Bridgeman is a fantastic author who always provides a quality story. Her books never fail to give the reader a full ride in excitement and adventure and An Aria for Nick is no exception!